Interior, looking towards the chancel. St Andrew's (Scottish Episcopal) Cathedral. Architect: Alexander Ross (1834-1925). 1866-69. Ross won the commission not long after his first partnership, with William Joass, was dissolved (see "Alexander Ross"). 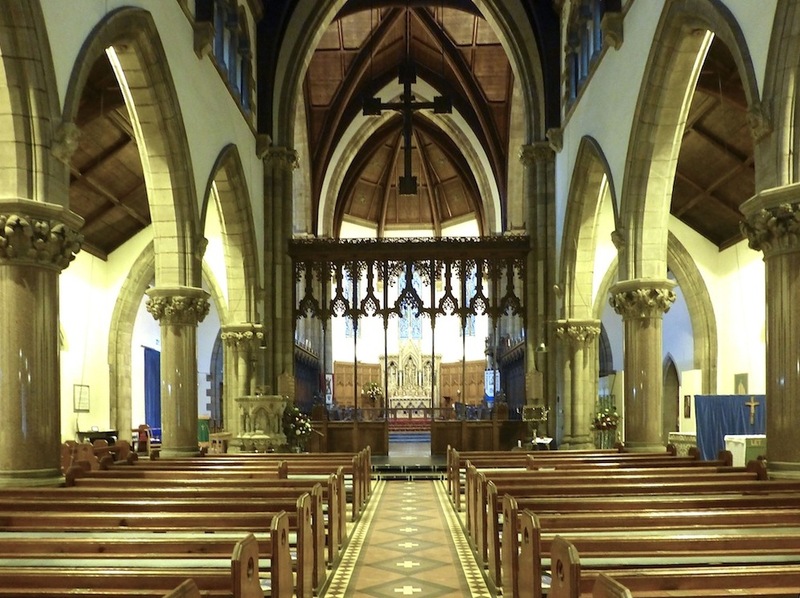 The nave has four bays, the arcades "carried on monolith columns of Peterhead red granite with foliated freestone capitals" (listing text). Left to right: (a) Nave roof. (b) Carved capital. 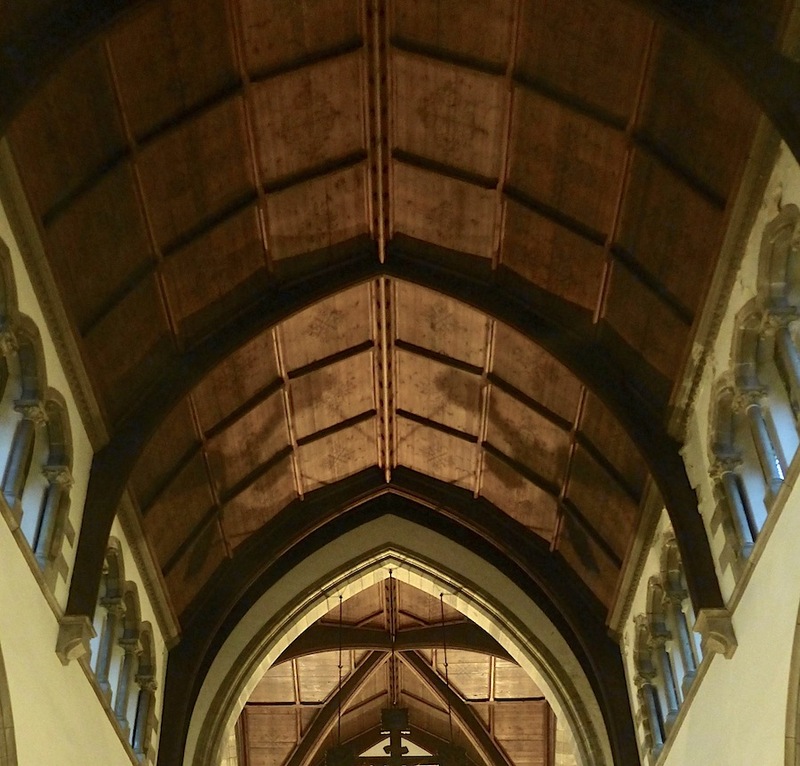 (c) Chancel, with its carved wooden openwork screen, and the roof into the apsed sanctuary. The panelled wagon roof is of "varnished red pine with stencilled patterns intended for colour decoration" (listing text). 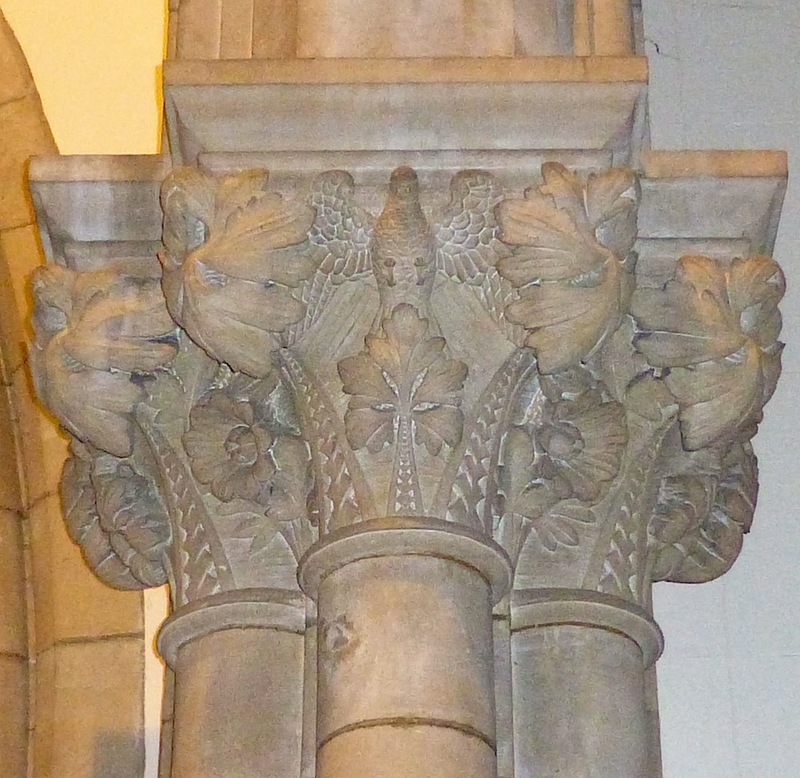 The capitals are carved with an interesting variety of natural-looking flowers and leaves: the one shown above also has a dove, the symbol of the Holy Ghost. Higher than the capitals, where the arches meet, are corbels with carved heads designed by Ross and mostly carved by Andrew Davidson (listing text): one of the first on the north side is a likeness of the architect himself, looking down on the congregation of which he became a part. 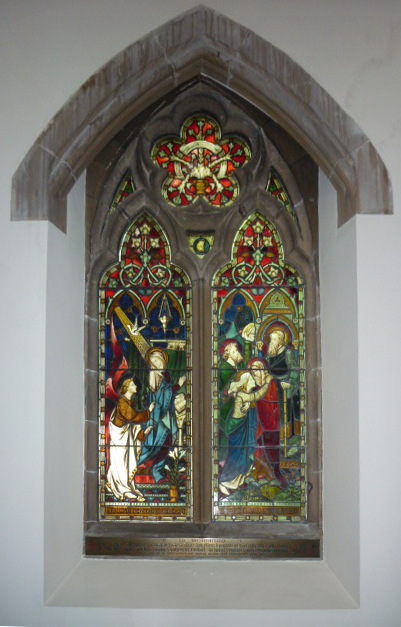 Another is of Queen Victoria, another is Bishop Eden, and another, said to have been produced by Ross, is St Philip (Gifford 188; listing text). 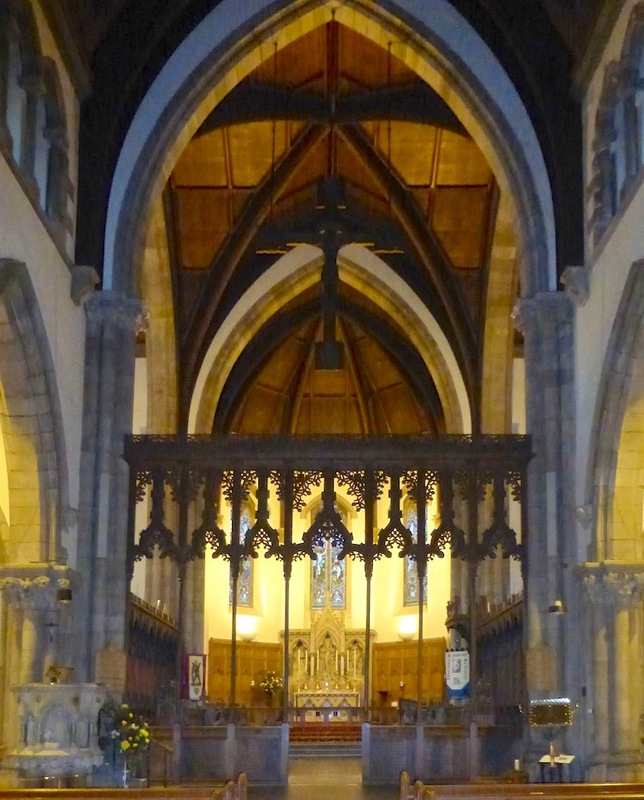 The chancel screen is a work of art: it was designed by Sir Robert Lorimer as a war memorial to members of the congregation who fell in World War I, and installed in 1923 (see "A Tour of the Cathedral"). 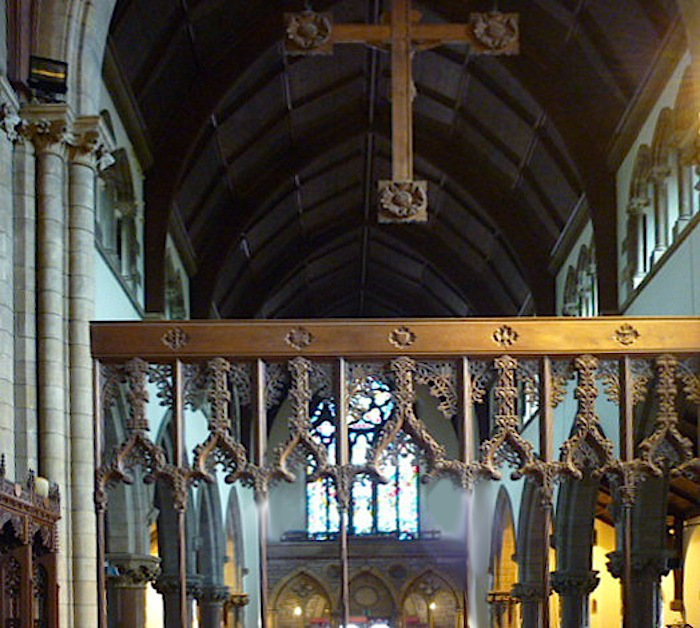 The wooden rood or crucifix suspended over it has symbols of Matthew, Mark, Luke and John on the front of the arms. 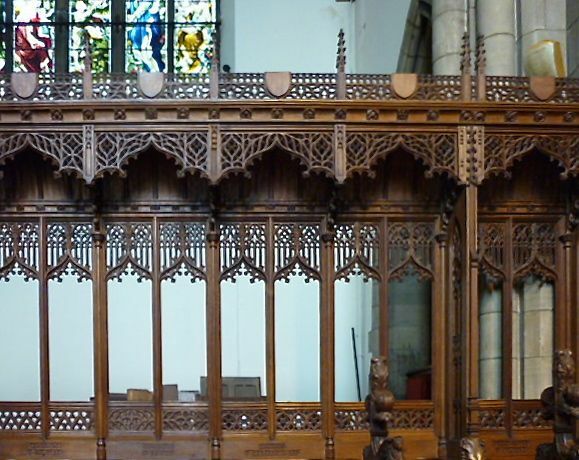 Left to right: (a) Intricately carved openwork screen above the choir stalls on the north side. (b) The apsidal sanctuary. 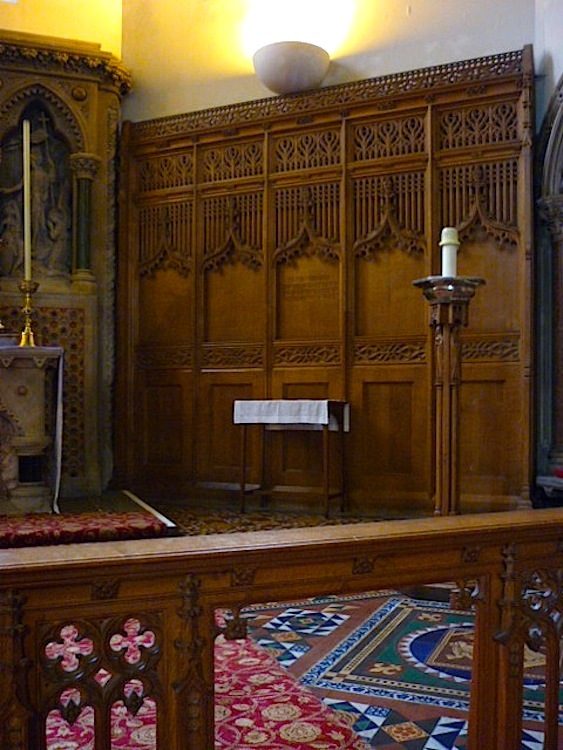 (c) Carved panelling flanking the reredos, and geometrically patterned Minton floor tiles on this (south) side of the sanctuary. The other wood-carving here is lovely too. 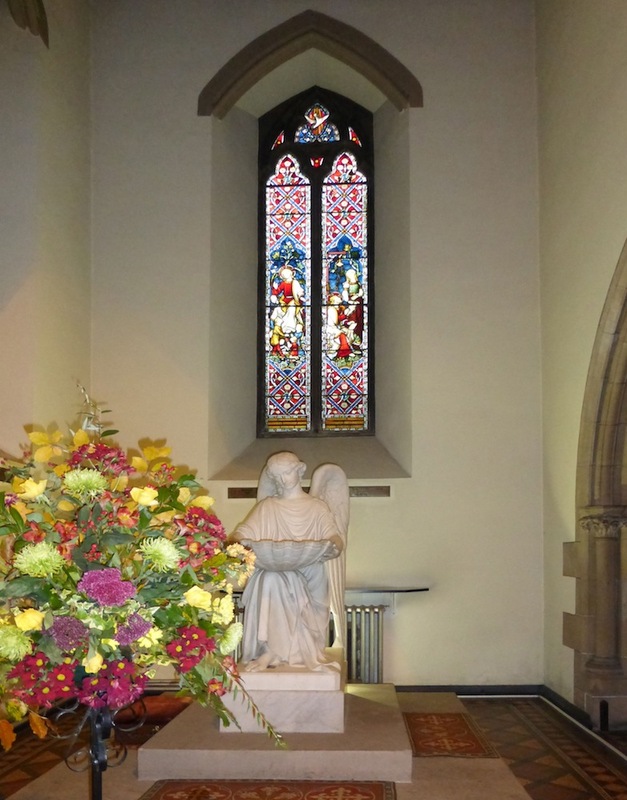 The stained glass windows in the apse, like the windows in the transepts and nave, are all by the London firm of Hardman and Co. The ones here and in the nave date from 1869-70. These show Jesus in the Garden of Gethsemane, the route to Calvary, the Crucifixion, and the Resurrection. The tripartite reredos of Caen stone, like the tympanum and statues at the west entrance, was carved in high relief by Thomas Earp, but earlier — in 1869. This too shows the episodes surrounding the central event of the crucifixion. The altar, only seen in part here, is of the same date and particularly elaborate, "with trefoil headed arches with serpentine marble shafts, panels of alabaster decorated with Christian symbols in alabaster and crystal" (listing text). The Minton tiles are original, dating from 1869 (this detail also comes from the listing text). Left to right: (a) Looking west towards the stone, Gothic-arched narthex. (b) The pulpit. 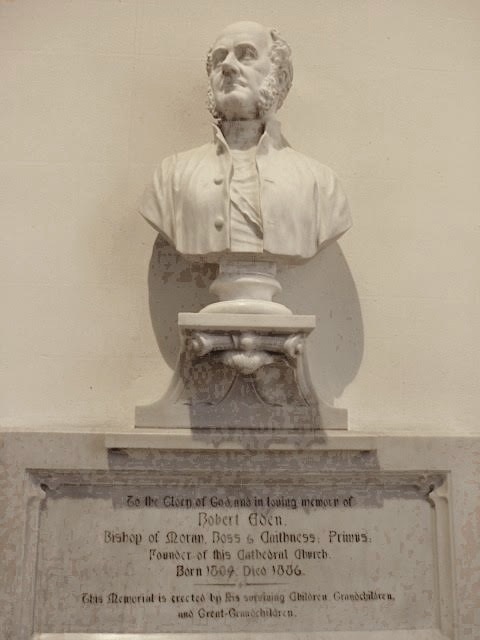 (c) Bust of the first Bishop, Bishop Robert Eden. When seen close up, the intricacy of Lorimer's chancel screen is amazing. The elaborate pulpit is another work of art. Designed by the architect himself, it was carved by the same firm that did the stone-carving of the corbels and around the door at the north-west tower — D. & A. Davidson, Inverness. 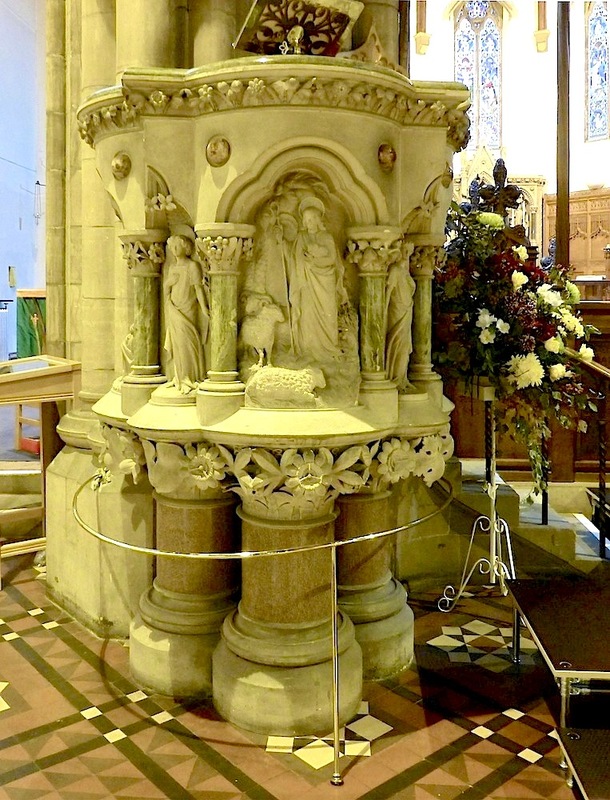 Of Caen stone like the reredos, it is supported by columns of Abriachan granite. Seen here is the main forward-facing panel in high relief, showing Jesus as the good shepherd complete with shepherd's crook, cradling a new-born lamb in one arm, with angels between the green marble columns on either side. At the sides are reliefs of St John the Baptist and St Andrew — John Gifford finds the carving "crude" (189), but it is very expressive. This dates from 1869. A much later work by Andrew Davidson is the splendid (and certainly not "crude") white marble bust of Bishop Eden on the south wall of the nave, dating from 1900. 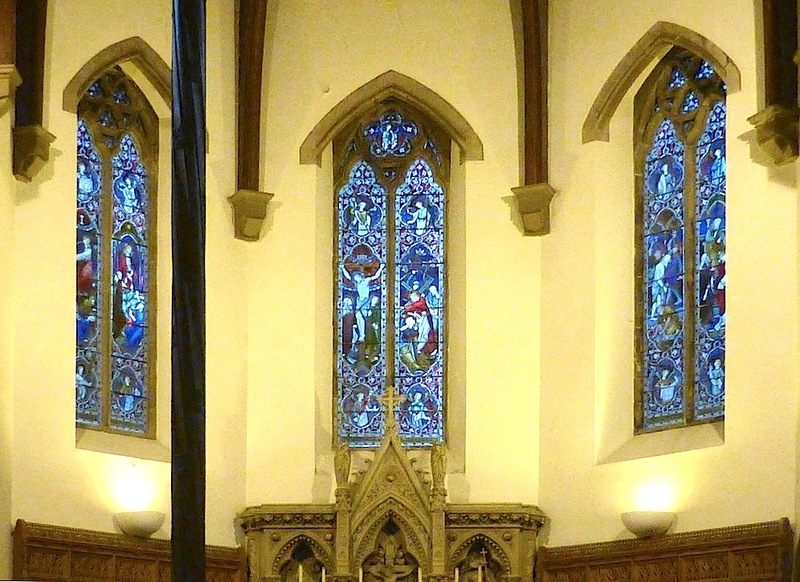 Left to right: (a) The first stained glass window, from the east, in the south aisle. (b) The small baptistry at the south-west end, at the base of the tower there. (c) Close-up of the font. The nave windows date from 1869, and show the teaching and miracles of Jesus (on the north side) and the events of his life (on the south). This one shows the Annunciation and Visitation, of Mary to her relative Elizabeth, who would become the mother of St John the Baptist. 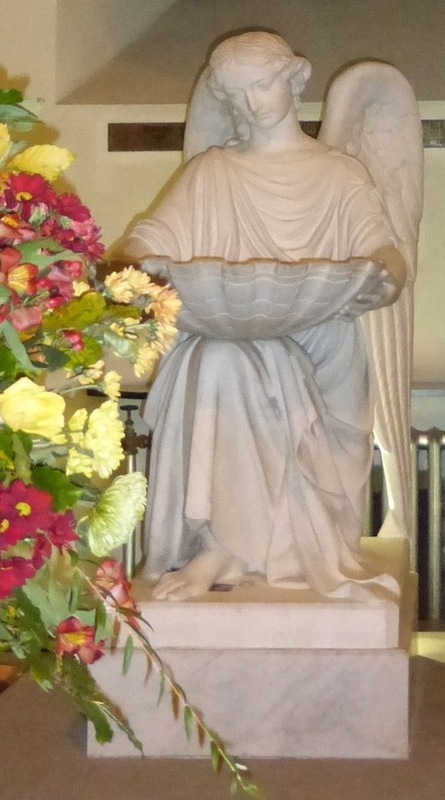 The marble font, in the form of a half-kneeling angel steadying a large shell-shaped baptismal bowl on the other knee, was carved by James Redfern, and completed in 1871. It was modelled after one in the Church of Our Lady, Copenhagen, by the famous Danish sculptor Bertel Thorwaldsen, marble, but the face is said to be a likeness of a Mrs Learmonth, the donor's wife ("A Tour of the Cathedral"). "Inverness, Ardross Street, Cathedral Church of St Andrew." British Listed Buildings. Web. 15 December 2017. "Inverness Cathedral." United Diocese of Moray, Ross and Caithness. Web. 15 December 2017. "A Tour of the Cathedral." United Diocese of Moray, Ross and Caithness. Web. 15 December 2017.